Lexington, Ky. (Dec. 19, 2013) — University of Kentucky College of Education senior Taylor Blair will graduate with a degree in secondary English education this Friday while also taking part in an important Commencement tradition: serving as student speaker. 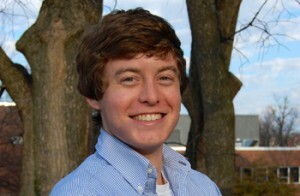 Blair, from Louisville, was selected among several candidates by UK President Eli Capilouto to represent his class at the December 2013 Undergraduate Commencement Ceremony. While there’s much to say about his UK experience, Blair decided to focus on those who made his experience possible. Blair has been very active on campus during his undergraduate years, serving as a Wildcat Ambassador for the UK Office of Undergraduate Admission and Registrar, a peer instructor for UK 101 and 201, and a member of the K Book editorial board. He is also a Provost Scholar. After graduation, Blair plans to continue working for UK Admissions while earning his Master’s degree. He then plans to become a high school teacher. But for now, Blair is just counting down the days until Commencement. The December 2013 Commencement Ceremonies will be held Friday, Dec. 20, in Memorial Coliseum. The Graduate and Professional Commencement Ceremony will take place at 1:30 p.m., followed by the Undergraduate Commencement Ceremony at 6 p.m. The ceremonies will also be live streamed on UKNow. For more information about the December 2013 Commencement Ceremonies, visit www.uky.edu/Commencement.